We are living in a world where everything is becoming wireless with Megabit and Gigabit speeds. These days even Power is transferred to a Smartphone wirelessly via Qi charging. There are some things which are wireless but their speed is pathetically slow to be of much use these days. The technology in particular is Bluetooth. Bluetooth has a theoretical bandwidth of 3 Mbps which is insufficient for our Media Transfer requirements. These days the image files being generated by the 10+ Megapixel camera is easily above an MB and the recording of a 1 minute HD/Full HD video easily goes above 100 MB. In order to transfer these large files to a laptop would take an hour over Bluetooth. The question here is “Can we not transfer these files via the USB cable?”. Yes we can but it kills me to do that because when everything has become so seamless, so why can’t we transfer files seamlessly? Is there any Faster Alternative to Bluetooth? Since Wireless is a half duplex medium, an increase in the number of users will result in the decrease of speed for all users since all users will contend for the same medium. The strength of a Wireless signal decreases as the distance from the Access Point increases and hence the Transfer rate decreases. There are also other reasons such as black holes where there is no signal. There are occasions where there are no Access Points and hence files cannot be transferred at all. Is there any better replacement to Bluetooth? A new wireless standard has come which can take the place of Bluetooth while providing high transfer rates. 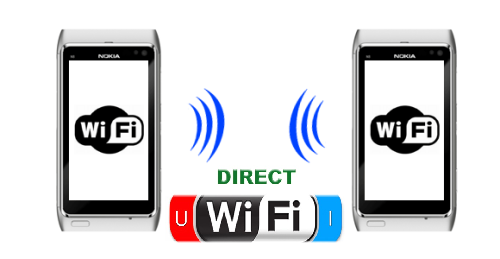 This technology is called Wifi Direct and it has theoretical transfer rate of 250 Mbps. What this basically does is create a wireless network the 2 devices for file transfer. This utilizes full transfer capabilities of Wifi as well as alleviating all issues pertaining to Infrastructure Mode Wifi. The problem here is that this technology is still in its infant stage and only has matured in the Smartphone realm. If you want to transfer large files between Smartphones, you can do it fast via Wifi Direct but this is not generally what we want. We want to transfer our Media content from Smartphones to our Laptops. Since we don’t have Wifi Direct capability on a Macbook, we can emulate it using other means. Note also that with new OS X versions, a protocol called Air Drop has been implemented which is much similar to Wifi Direct but proprietary. This restricts Files Transfer between Macbook to Android. We will make the Mac as a Wifi Direct Server while the Android Smartphone will be a client. Once the connectivity will be established, we can transfer the files via ES File explorer using Windows File Sharing. Although there is no concept of Wifi Direct Server but I am calling it so because the Mac will act like an Access Point. Basically what we are doing is enabling Internet Sharing on Mac. We start by going to Apple>System Preferences>Internet&Wireless>Sharing. Here you have to select the option of Internet Sharing (Do not check it as of now). When you select it, you can see the Network interfaces of your Mac on the right. From here, select any Network interface from “Share your connection from” except Airport. Since we are not interested in actually sharing the Internet, you can select Bluetooth, Unconnected Ethernet, etc. In the “To Computers using”, check the Airport interface. Now that we have selected the input and output interface, we can click on the check mark for “Internet Sharing”. Now “Start” to start the new connection. Your Mac is ready to host a Wifi connection. If you are interested in naming the Access point, keeping a password, etc, you can do so in the options while setting up the Wifi. You should see an Access Point by the name of your Macbook. Join it and you are now connected to the Macbook Directly without the presence of a Wireless Router. There are some steps we need to take before we are ready to transfer the files. Since we will be using Windows File Sharing, we need to enable it if it already isn’t. We need to join a Workgroup. All computers by default are part of the “Workgroup” work group. 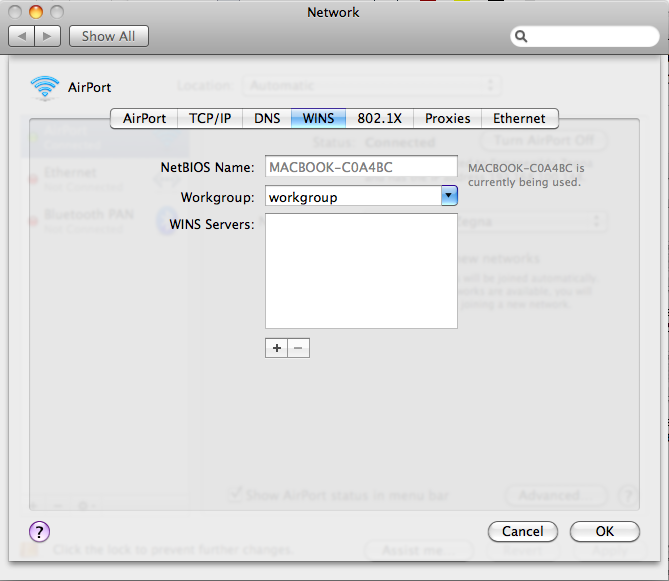 Go to Apple>System Preferences>Network>Advanced. Here in the WINS tab, set the work group to “workgroup”. In order to transfer files to the Mac, there has to be some folder which is shared. Share the folder you want to copy files to. You can do this by right clicking the Folder and clicking “Get Info”. Expand the “Sharing & Permissions” and you should see the user list. Change to read and write according to your requirement. Now we need to enable File Sharing. For this, go to Apple>System Preferences>Sharing>File Sharing and change the “options”. 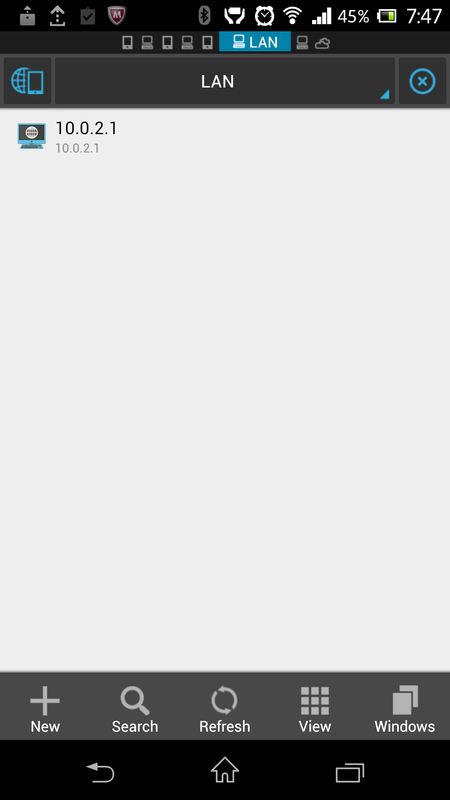 Check Mark “Share files and folders using SMB”. Below that check the user for which you want to enable Sharing. Click on “Done” and you will also see the folder you have shared and the rights for the folders. Check on “File Sharing” and you are done with the Macbook settings. Note: Remember that the unlock icon is shown while doing all the settings or the settings will not be saved when you exit. Go to the Google Play Store and install ES 3 File Explorer. There is no need to install this if you already have a file browser on your phone which supports Network File Sharing. Once you have the File browser installed, go to LAN and click on search. 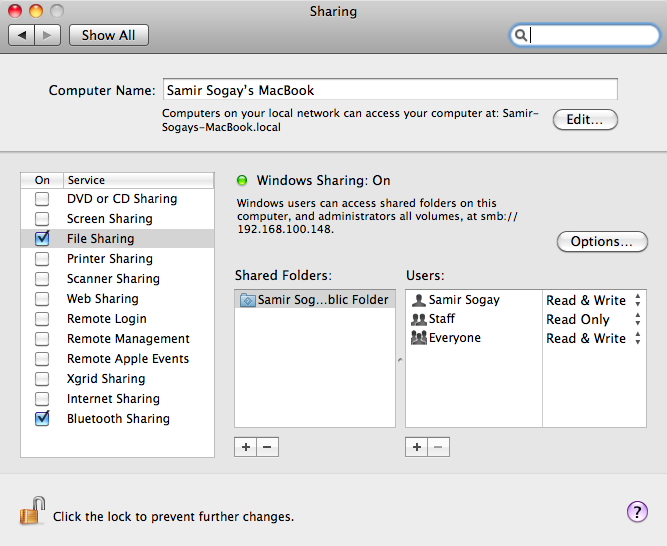 This will search for all Network Shares and should show the folder you have shared on your Macbook. Copy the file from your Macbook and paste it in your Android or browse to the file you want to transfer to your Macbook and copy it and then browse to your Shared Folder and paste it. This entry was posted in Connected Home and tagged android, fast, file, mac, Macbook, smartphone, transfer, wirelessly by samirsogay. Bookmark the permalink. This article was written when I was still using Snow Leopard. In newer OSes, you should find it here Apple>System Preferences>Sharing. Here, select Internet Sharing (Do not check mark), you should see all the interfaces. I don’t think there are any Airport interfaces these days. Instead choose the Wifi interface. Well, thanks for your tutorial but it didn’t work for me. I’ve got a MBP early 2011 on Mavericks and a Galaxy Note 3. I did every step you wrote but my phone doesn’t find my macbook, nor on wifi neither wifi direct. Such a pity. I spend hours to find a solution and I see nobody knows how wifi direct is really working (that’s why there are so few topics about it). Finally I found an app called Superbeam. You can find it on the Play store (there is a free version and a pro which “unlock” some extras) or cracked on internet (I let you find, as it’s surely illegal). Anyway, it works really good between both devices. Just have to install Superbeam on the computer too. So easy. I used the QR Code connexion. So easy again. I let you guys find the explanations on their website or elsewhere. I hope this post will help others poor souls lost on internet like me who were looking for this solution. Samir, let me know if you know how to resolve my problem or if you have another solution. As I wrote above, the better for me is still make the connexion working between both devices without any app. Thanks again for spending time to write this article. Thanks for your inputs. As far as working without an App is concerned, this is the only way with lots of hard work. I cannot say for sure why your android is not seeing the mac. Had it been windows, I could have asked you to disable firewall. Are you able to ping android from mac? Also, what App you are using on the android? As far as Superbeam is concerned, I have tried it and liked it between Androids but from PC and Mac, it requires us to buy which I am not going to do. There was an App from Lenovo as well but not available for Mac so had to let it go. Now I am using Filedrop on all my devices Mac, PC and Android. It works nice and even if it does not work some time, you have the option of entering a code which then automatically finds the other device. After using Filedrop, I have uninstalled Superbeam and the Lenovo software. I have the exact same devices as SR (late ’11 MBP, now running Yosemite, & Note3), and never could get it to work, either. I managed to get ES3 File Explorer to see my MBP, but I could never login to it. Gave up after 5 hours of wrestling. Meanwhile, a freeware called Wireless Transfer App, available at App Store for MBP & Play Store for Android, works fine. But, it’d be much better if wifi transfer worked directly via Share within Gallery/photo app, as it does with every other Share option!